Just think Forth Rail Bridge, but in a different colour. Cream coloured. Not rust coloured. Although the bus does have its fair share of rust coloured stuff. Mostly the rust. I like the word rust. It’s a better word than rot. Rust sounds like something that can be made better, given a little bit of TLC. ‘My golf swing’s a little bit rusty – give it a bit of a polish and it should come good’. Rust is also one letter away from rest, or a vowel sound away from roost. They’re comforting words too. We should come to love the word rust really. But we’re not painting the bus interior rust colour. We’re painting it cream – which is nice word – or is it? Can’t it also be a defeatist word? ‘We got creamed last night; absolutely creamed’. I have to say, I’ve never knowingly been creamed before and I’m not sure I’d really want to. Hence my point. The bus was going to get creamed and I was the one doing it. Although, to be fair, I wasn’t coming out on top in this exchange. Ahhhh John had cut all the wood to shape. And it fitted snug in the dry-fit run, but it makes sense to paint the thing before screwing it all into place. So I got as many old towels, sheets and dust covers as Sarah could find me and set to work. In hindsight I should have seen this as Sarah’s opportunity to replace the ‘perfectly all right’ but old towels and bed sheets given the amount of ‘dust covers’ she found for me. 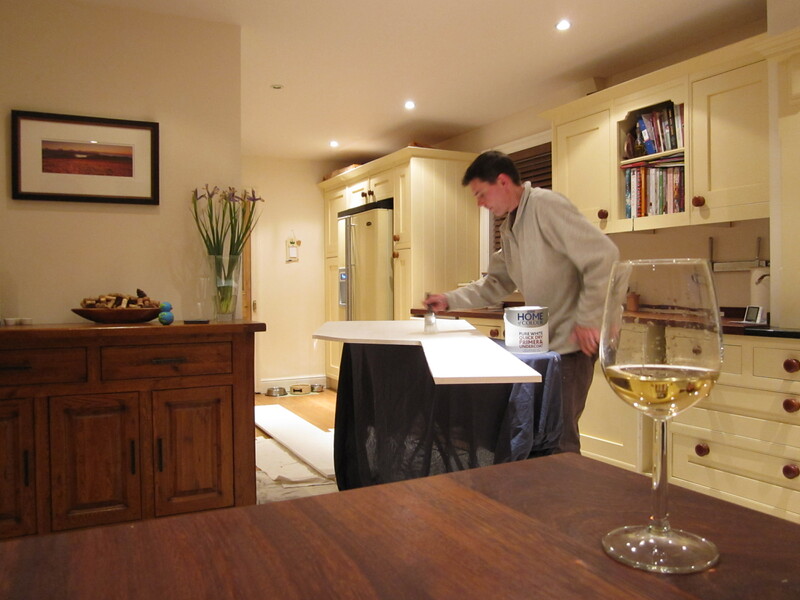 The kitchen soon became my painting shed and the ironing board my table and trestle. I can’t remember now but, unassembled, the interior probably amounted to about 15 pieces or more – some of which were eight feet in length. That’s longer than a man. The plan was to give them all a coat of primer, an undercoat and then the top coat. No – make that two coats of primer given how rubbish one coat looked. Yeah, add in a second top coat too – for super safety. So that’s both sides and edges painted with five coats of paint each! Man alive….. Being super clever we bought kitchen/bathroom paint for the top coats as this is both resistant to moisture build up and is also wipe-able for those food and drink spills. We’re not all stupid you know. Several proverbial Forth Rail Bridges later most of it was done and ready to be assembled. I say most because, me being me, meant that a few solitary bits never quite got finished because we ran out of time. The assembly man was coming. No no, not the headmaster. Ahhh John…….. I hate acronyms like TLC. Maybe it’s an age/era thing. Apparently I have a crap SOH and hardly ever make people LOL. ‘They’re still racing out at the Trestles’ – Darkness on the Edge of Town, Springsteen (1978). 30+ years later and I’d imagine they’re still there. Racing out at the Trestles. This entry was posted in The SapaBus Blog and tagged campervan refit, Springsteen, Type 2 interior, Type 2 Refit, VW Bay, VW Campervan. I can’t believe I was unaware of your blog for such a long time, Paul. While I was sitting in a meeting discussing sober topics like how to most inefficiently spend tax payers money, not a very entertaining afternoon occupation, my fellow colleagues must have wondered why I was grinning over both ears every now and then, on top of a rather joyous mood. I was reading your blog under table. And clearly, you made me laugh! Pity we haven’t met up last summer, love to see you again. Hey ! You found the blog. You need to go to blog 1 and start there if you have the energy for it. I read your book about the Rat, The Cook and The Heretic. It was based on the next village on from where we were staying last summer ! Not sure the bus will make France this year, but agree it would be good to catch up again. I went through all the blog entries, didn’t want to miss one. I like them a lot! Looking forward to the next instalment (if you find the time). I nearly bought a 1972 bus when I just got my license. Ex-civil-protection car with just 30.000 km on it. The expected fuel costs kept me away, I invested the money in my bike instead. Which isn’t nearly as fast nor does it offer a place to sleep. I’m glad you like the blog – another entry is not too far away. I forgot to say – it’s an 1800cc engine – a bit unusual I believe. You’re not wrong about fuel costs by the way. A 100 mile round trip will cost you £30 in fuel these days. But then a bus wil hold its value, so you will get your money back if and when you sell on.